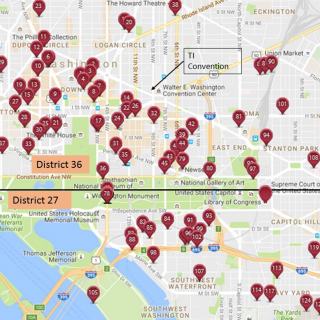 Local TI Districts – Toastmasters 2016 International Convention – Washington D.C. The first Toastmasters club in the Washington, DC, area formed in October 1948 as Junior Board Toastmasters Club #640. It came out of the Washington Junior Chamber of Commerce. A second club formed in early 1950 as Potomac Toastmasters Club #827 without knowledge of the first club. These two clubs and other organized, undistricted clubs in the Commonwealth of Virginia and the District of Columbia led to the formation of a Toastmasters Provisional District in February 1951. Full District status was awarded on May 2, 1952 and District 36 was designated as the new district’s number. More than 300 members in 12 active clubs constituted District 36 at that time. District 36 has a strong history which can be reviewed on the District 36 website, www.district36.org , select ‘Meet District 36’ and select any of the three ‘History’ links. In 1989-1990, District 36 originated club officer “Nuts and Bolts” training and initially the “Toastmasters University” label. This was changed by the Board of Directors to “Toastmasters Leadership Institute” (TLI). Another historical first for D36 was the first female winner of the World Championship of Public Speaking, Evelyn-Jane Davis (also known as E.J. Burgay), in 1977 at the convention in Toronto, Canada. She became the District 36 Governor ten years later and served on the Board of Directors in 1991-1993 from Region 8. Within 2 miles of the convention hotel are 105 clubs in District 36 or District 27. Click the map to connect to the Find-a-Club listings at TI’s website. The convention hotel is physically located in District 36. The National Mall is one of the dividing lines between Districts 36 and 27. 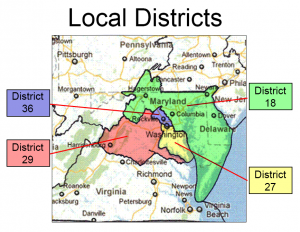 Although it has the highest district #, District 36 is the oldest district in the metropolitan DC area, spawning off in chronological order District 66, 18, and 27. District 27 split in 2011 to form District 29. Many club members live in one of the four local districts, work in a second, and are members of clubs in a third district. District 36 is the smallest of the four local districts in geographical size and can be traversed in less than one hour (if no traffic delays exist!). 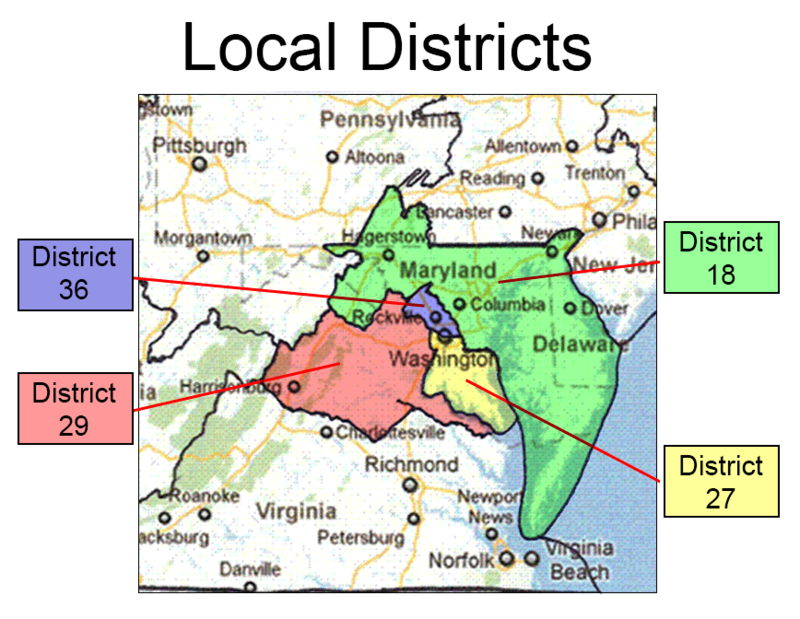 District 18 is the largest in geographical size and includes parts of five states: West Virginia, Virginia, Pennsylvania, Maryland, and Delaware. This year, both District 29 and 36 achieved Select Distinguished District status and they will be recognized at the Hall of Fame Thursday night. Expect to see many club members on the stage and to hear lots of whooping and hollering!”.